Equipment managers in every region share a common need: to obtain accurate information on machine productivity so they can improve the economics of their operations. In response to this need, FERIC has developed a second-generation datalogger, the MultiDAT, an electronic device that can be installed on any machine or vehicle. When linked with up to four sensors, provided by the user, the MultiDAT can record the operation of the related functions. This permits analysis of the duration of a function’s activation, the number of activations, and measurement of a frequency at specific intervals (e.g., monitoring a speed sensor). The MultiDAT comes equipped with an internal motion sensor that detects movement of the machine, but not vibrations of the motor. In many cases, you can quickly determine the true operating time for a machine without requiring any additional sensors. Add the GPS option to collect positional data and determine the areas harvested or treated. These data can be exported for analysis using ArcView or compatible software. The operator can enter codes on the MultiDAT keypad that describe the work in progress or the reason for machine downtime. You can customize the codes for your operation and determine the hours the operator worked, the type of work done by the machine, and the reasons for any work stoppages. Even the report format is configurable. Using the MultiDAT software, select the information to compile and how to compile it (e.g., daily, weekly, by operator) using your personal computer. * The MultiDAT Jr does not let you record this information. What is the multidat system? 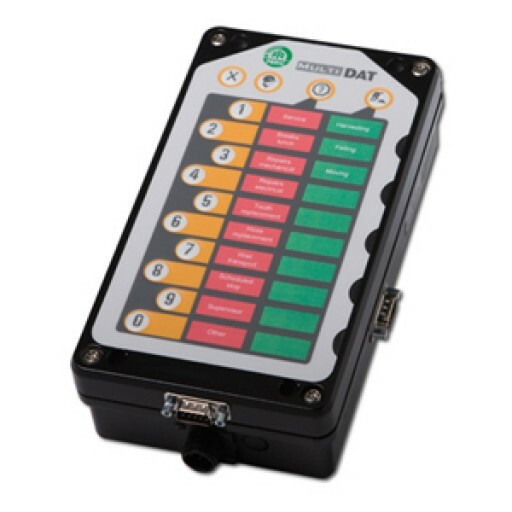 A compact electronic datalogger protected by a rugged metal case. An optional GPS receiver with an external antenna is also available. Offers all the features of the MultiDAT, except for the operator interface. A choice of either a low-cost data shuttle or a more rugged data shuttle that can be used to transfer the data from the MultiDAT to your personal computer and to adjust the sensitivity of the MultiDAT’s motion sensor. An operator interface with backlighting (not available for the MultiDAT Jr) provides inputs for operator numbers, activity codes and stop codes. User-defined codes are available, and can be printed on labels. Operating current 850 mA max. Warranty The MultiDAT is guaranteed against all manufacturing or material defects for a period of 12 months following the date of purchase.